Posh star Danny Lloyd celebrates his early goal against Bury. Photo: Joe Dent/theposh.com. Transfer-listed Danny Lloyd scored twice as Peterborough United edged closer to the play-off places with a 3-0 League One home win over Bury today (December 23). Top scorer Jack Marriott also netted against a bottom of the table Bury side who were more than competitive until centre-back Eoghan O’Connell was sent off 12 minutes into the second-half. Danny Lloyd (10) heads home the opening goal of the game for Posh against Bury. Photo: Joe Dent/theposh.com. Posh were 1-0 up at the time, but Bury were threatening to equalise. The win moved Posh into seventh place, just a point outside the play-offs positions. Posh had been warned to be wary of Bury despite their struggles this season, particularly away from home as they had picked up just four points from 11 games on their travels. But a third minute goal for Lloyd should surely have eased those concerns. The lively striker, a matchwinner at Fleetwood last week, met Marcus Maddison’s corner with a close-range header, a surprise as he was, as usual, the smallest player on the pitch. But for the rest of the half Bury played the slicker football. 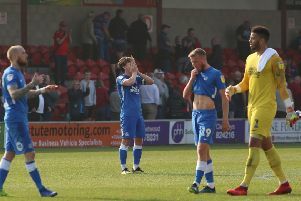 They were frustrated by poor final balls, poor shooting from the edge of the penalty area and by the excellence of Posh goalkeeper Jonathan Bond. Bond was at his best to tip over a brilliant 35 yard strike from Rohan Ince five minutes before the break, but a push round the post of a 15th minute shot from Danny Mayor wasn’t far behind. Bury’s passing was often quick and accurate, in direct contrast to Posh who could find no way of getting the division’s top scorer Marriott into the game. Posh replaced Jermaine Anderson with Chris Forrester at the interval, but Bury continued to impress more with Jay O’Shea hitting the outside of the post from 16 yards. But the game turned on two yellow cards in two minutes for O’Connell, first for a deliberate handball and then for a clash of heads with Maddison who just beat him to a high bouncing ball. That gave Posh over half an hour to play against 10 men and they took advantage in fine style. Maddison’s superb chip to an unmarked Marriott led to a 19th-goal of the season for the summer signing thanks to a well-placed header. And a stunning 30-yard smash into the top corner from Lloyd made it 3-0 with 20 minutes to go. Posh cruised through the final stages, soaking up a rare experience of back-to-back League One wins, something that hadn’t happened since August. Posh: Jonathan Bond, Alex Penny, Andrew Hughes, Ryan Tafazolli, Steven Taylor, Anthony Grant (sub Idris Kanu, 80 mins), Michael Doughty (sub Leo Da Silva Lopes, 64 mins), Jermaine Anderson (sub Chris Forrester, 46 mins), Marcus Maddison, Danny Lloyd, Jack Marriott. Unused substitutes: Conor O’Malley, Liam Shephard, Lewis Freestone, Junior Morias. Bury: Leonardo Fasan, Greg Leigh, Eoghan O’Connell, Phil Edwards. Josh Laurent, Nathan Cameron, Chris Maguire, Danny Mayor (sub Harry Bunn, 69 mins), Rohan Ince (sub Stephen Dawson, 69 mins), Jay O’Shea, Nicky Ajose. Unused substitutes: Scott Moloney, Jordan Williams, Callum Reilly, Tom Aldred, Michael Smith.. Goals: Posh - Lloyd (3 mins & 71 mins), Marriott (63 mins). Sending off: Bury - O’Connell (second yellow, foul). Bury - O’Connell (deliberate handball).